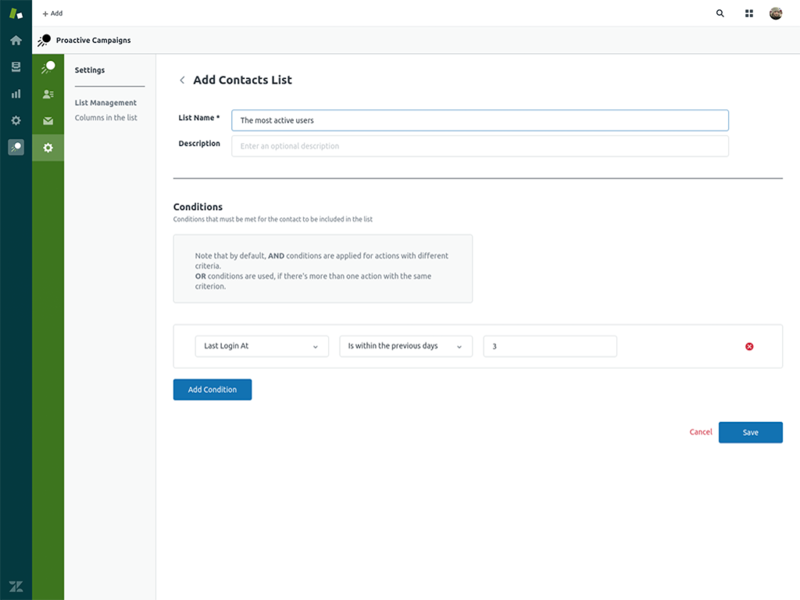 Create user lists, and bulk create tickets as email campaigns without leaving Zendesk. Deliver better customer service by reaching out to customers at right times. Better customer experience starts with proactive customer support. 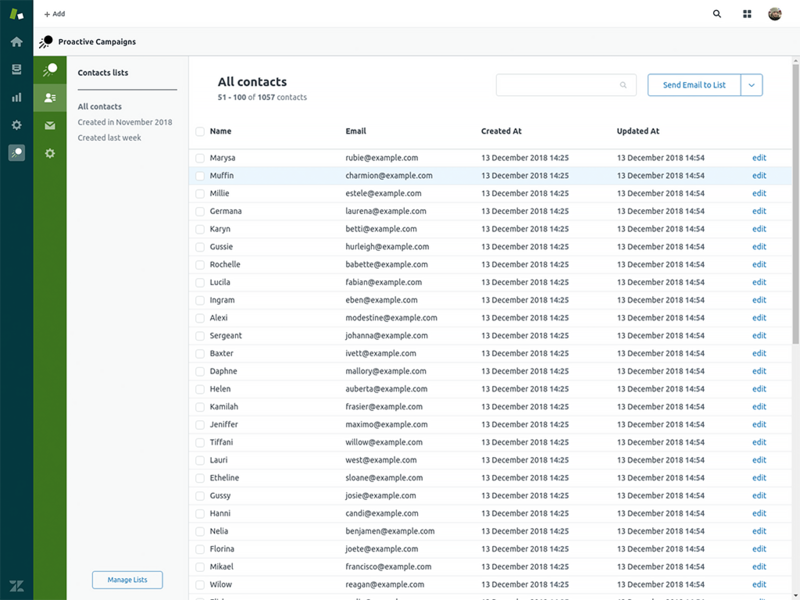 Proactive Campaigns enables you to target a specific list of contacts and prevent support issues as well as surprise your customers with attention to detail — all without leaving Zendesk, regardless of your pricing plan. Choose the criteria to filter the customer database and add contacts to your list. You can specify one or several criteria to form the list. 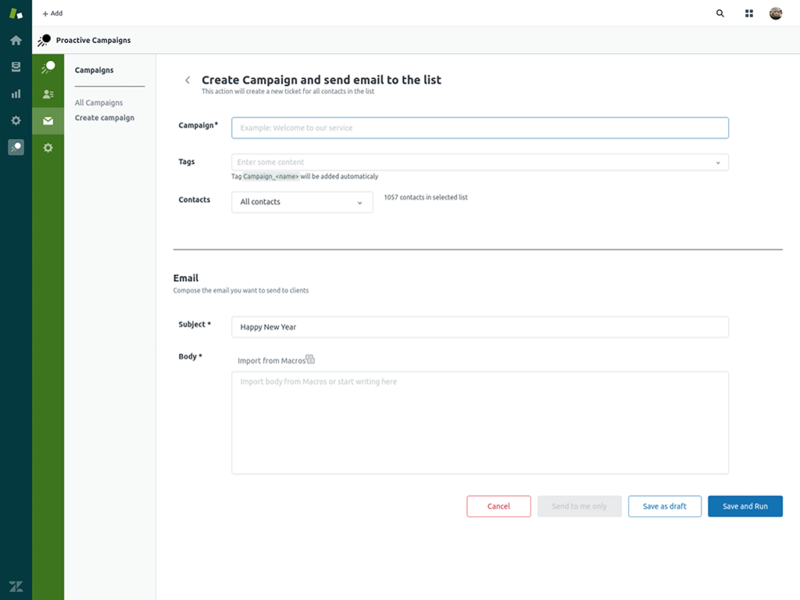 Once you've built and launched the campaign, Proactive Campaigns will start raising tickets on customers' behalf and sending out email notifications. Replies from your customers will be automatically picked up by Zendesk. No scattered or lost data! All information is kept on one place. Quickly and easily contact your customers at right times to prevent support issues or inform about an important occasion, i.e., a subscription renewal. Proactive Campaigns is available for all pricing plans and is totally free. Sign in to your Zendesk Support account and click the Admin icon in the sidebar. Select Apps → Marketplace, then find the Proactive Campaigns. On the Proactive Campaigns app page, click Install. Select the account to install this app and click Install. After the app is installed, you'll see the Proactive Campaigns icon appear in the left navigation bar.